Question: What should I know about genoa furling systems? From the Rigger: If you buy a furler, you will use your boat more often (no science here, but we know it is true). This is the first thing you should do to make sailing easier! A good furling system leads back to the cockpit and keeps your crew off the bow and possibly out of the water. The headsail can easily be handled by one or two people (thereby impressing your guests who likely have a beer in one hand and a handful of chips in the other). 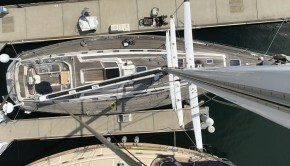 When winds pipe up, the sail can be reefed by simply furling the sail (from genoa to jib… voila!). No more pesky sail folding, dragging a bulky headsail in and out of the cabin or putting it away at the end of a long day. Your jib sheets stay connected and don’t have to be rerun. Like a shiny hood ornament, a new furler makes your boat look really nice! Everyone wants a system that is strong, light, reliable, and easy to use, but there are choices to be made, so let’s review your options. Perhaps the first question should be… what type of sailor are you? Cruisers may prefer a dependable workhorse with few working parts and a raised drum to provide better visibility under the sail. Racers are more likely to want a light-weight system that sits close to or even below the deck to maximize sail area, has dual grooves to facilitate fast headsail changes, elliptical extrusions for improved air flow, and perhaps a removable drum. 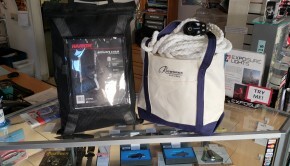 Trailerable sailboat owners may want a furler that is very easy to connect. So, ask yourself… what is important to you? Next, what are you are willing to spend? Are you looking for a basic system or a shiny one with all the bells and whistles? 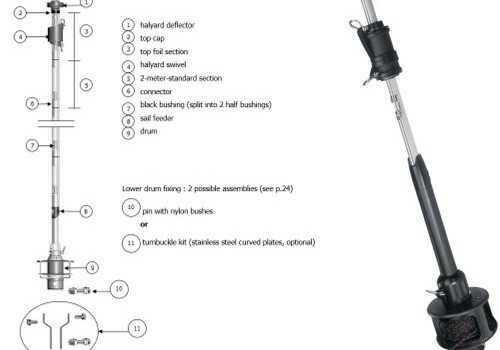 Obviously, price is affected by the size of your boat and forestay, how the furler connects at the masthead and base, the quality of the various components, the features you select, etc. At Rigworks, we can help you explore options within your specific price range. We suggest that you let our riggers install your furler. Whether we need to remove the existing forestay or simply install the furler over what you have, we do it quickly, and we do it right. You can help by providing us with your forestay diameter and length, pin size, and connection type. The initial forestay measurements are key to ensuring that your new furler fits properly. To ensure that it coils properly, your furling line should leave the drum at a 90-degree angle, and we recommend that you lead it back to a ratchet block in the cockpit. A ratchet block will provide added tension making your furling line spool better and reducing the likelihood of wrapping in the drum. If you are wondering if the luff (leading edge) of your current headsail will fit into the new furler, come into Rigworks and borrow our luff tape and extrusion samples to test on your sail. #6 luff tape has generally become the industry standard, it is likely that your current sail will fit. If not, sailmakers can alter your sail with the proper luff tape. UV protective cloth can also be added to the leech (trailing edge) and foot to minimize stretch and sun damage to the exposed section of sail when furled. 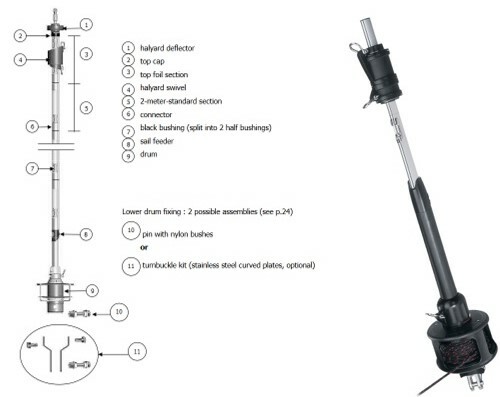 Harken, manufacturer of quality furlers, recommends… “keep equipment clean by frequently flushing with fresh water. In corrosive atmospheres, stainless parts may show discoloration around holes, rivets, and screws. This is not serious and may be removed with a metal polish. Keep sail luff clean and inspect for signs of damage and fraying. Repair if necessary. If lubrication is required, spray a thin coat of McLube® Sailkote™ [available at Rigworks] on sail luff. Be sure to let sail dry before feeding sail into the foil.” They emphasize that spraying McLube Sailkote directly on Carbo Racing Foil may damage it. 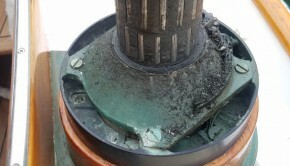 At least once a year, inspect the masthead and base connections and check for chafing and other issues along the entire length of your system. Please do not install a brand new furler on an old forestay. As we mention often, your forestay KEEPS YOUR MAST STANDING (yep, caps!). If you are investing in a new furler, replace your forestay. Always keep light tension on your furling line as you roll the sail out and on your jib sheets as you roll it back in. This will ensure that the furling line spools neatly in the drum to avoid wraps. Watch those electric winches! We have repaired many furling systems that were stressed by an enthusiastic sailor on an electric winch. As they say, a little power goes a long way. We recommend that you keep your eye on the furler not on the winch button! Head downwind before furling to buffer the headsail behind the main, reduce flogging, and decrease the overall load on your system. Watch your spinnaker halyards which can easily get caught in your furler. This is the most common problem our customers have with their furling systems. 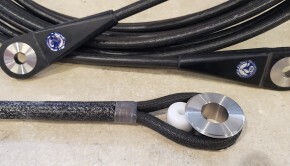 Consider hardware such as halyard deflectors to help prevent halyard wraps, the most common and frustrating type of furler jam. Use pennants on the tack or head to move your swivel to the proper height. On a mid-sized boat, you usually want to leave 8 inches to grow. Make sure that you have the proper luff length on your headsail. If the luff is shorter than the foil, the exposed halyard is very likely to wrap. Should your furler jam, it is very likely a wrapped halyard or jammed drum. If the halyard is wrapped at the masthead, try alternatively pulling on the sheet and furling line to ease the wrap. Do not apply too much power or you risk breaking your furler, or much worse, breaking your headstay and losing your mast. If the furling line jams in the drum, it is probably an override that you may be able work loose manually. In the worst case, if you simply cannot clear a jam, find some open water, drop your mainsail, remove one jib sheet and drive the boat in tight circles to wrap the sail around the headstay. You won’t get it all the way in, but you can reduce your sail area enough to get back to the dock. Then when you have a moment, give us a call here at Rigworks. Our riggers are happy to help.